The annual KROQ Weenie Roast y Fiesta marked its 25th year with a new venue – the Stub Hub Center in Carson, Calif, seeing as its previous home at the Irvine Meadows Amphitheatre has been demolished – and a remarkably strong line-up that included a number of female performers who truly ruled the stage and commanded the mini-stadium. Even the sweltering heat, with the temperature at over 90 degrees, didn’t keep away the over 25,000 music fans who turned out for the sold-out show on May 20th. After Andrew McMahon in the Wilderness kicked things off on the main stage, the AFI / No Doubt mash-up band known as Dreamcar saw frontman Davey Havok strutting around the stage, striking poses, in stark contrast to the subdued and demure Lana Del Rey, who followed. Del Rey’s dreamy vocals had her teenaged fans in the front shedding tears and handing her gifts and flowers, throughout the length of her set, and she took the time to stop and greet them and sign autographs. One of the most fun and highest energy sets of the day was from Paramore, whose frontwoman, Hayley Williams, danced and spun and ran around. In an unusual move, but one that the fans ate up, the band opened and closed with their latest single, “Hard Times,” which is an undeniably catchy track. Williams even brought up a fan to help sing on “Misery Business,” who seemed nervous at first, but then fully embraced the opportunity and made the most of it, for what is sure to be a long-lasting memory. Up next was 311, who made their way through one hit after the other and had the crowd dancing and singing along, before madman frontman Matt Shultz gave his best strut, as Cage the Elephant turned in a blistering set that left it all out on the stage. And then, Imagine Dragons kicked things off with “Radioactive,” which is a track that just never gets old, played a stripped down version of “It’s Time,” and made sure to include “Believer.” Singer Dan Reynolds clearly loves and is at home being on stage, and has the talent to sustain a long-time career. 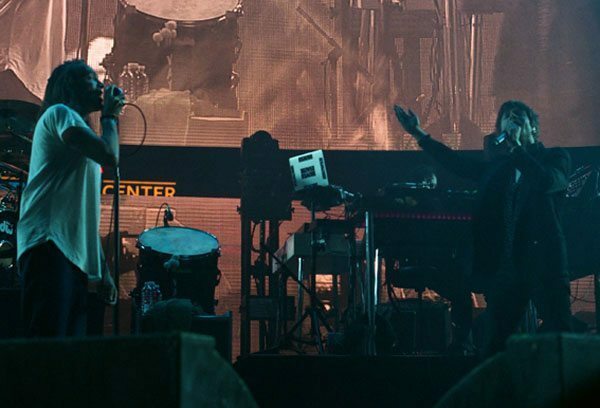 After 311 and Imagine Dragons both made mention of how they were affected by the recent loss of singer Chris Cornell, Incubus took it one step further when singer Brandon Boyd brought Matt Shultz back to join him on a stunning and heartfelt rendition of “Black Hole Sun,” as an image of Cornell was on the screen behind them. And although headliner Lorde suffered from some technical difficulties at the beginning of her set, she weathered it well, as she joked about not being very funny while she tried to kill time. By the time things got back on track and she was able to get back to the music, those technical difficulties were easily forgotten, as she sang and danced around and made a point of mentioning how happy she was to be back on the stage and performing again. As always, the KROQ Weenie Roast was a night of truly great music that seems impossible to top, but that always manages to do so, the next year.